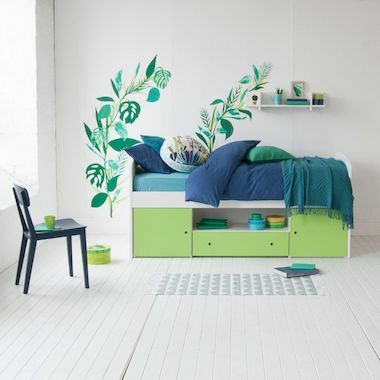 One of the biggest trends this summer has got to be Tropical Foliage. It’s everywhere, from plate designs, to wallpaper prints and more! 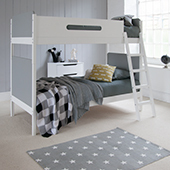 We thought it would be the perfect pairing for our Frooti cabin bed in lime, so we got Fi in from The Cubby Hole to have a go at helping us create our very own bespoke Tropical Paradise for a child’s room. As you know, we’re all about providing our customers with interiors inspiration and tips on how to create the look, so we sat down with Fi and chatted through the process. 1. Buy some paint sample pots in a range of greens. We used emerald, lime and grass greens, but you can also use any leftover green paints that you may have in the house from previous decorating projects. 2. Spread out some plain white A3 paper, remembering to protect the surfaces underneath, and have fun painting! The objective is to create texture by leaving in the brush marks and layering the different shades. Try to cover as much of the paper as you can, being careful not to overload your brush with paint (a near-dry brush creates a paint effect full of texture). Top Tip: Apply darker shades first, and add lighter colours on top. 3. Once the paint is dry, using a pencil, draw on some tropical leaf shapes. Ferns, Philodendron split leaves and Fan shapes all have a strong look to them. Repetition is good, so create multiple versions of the same leaf. As a rough guideline, some of our shapes took up an A4 page, and some A3, which all added to the layering effect. 4. Once the paint is dry, taking great care, cut out the leaf shapes until you have a large variety of shapes and sizes. 5. Repeat the process of drawing and cutting, but this time with plain green card (we used emerald). 6. By the end of this process you’ll have a range of foliage ready and waiting to be applied to the wall. 7. Prepare your wall for the mural by ensuring that it is clean and dry, with no lumps or bumps. For our mural we roughly painted on a large leaf shape. This created a good guide shape for us to follow, and also created visual depth. 8. Using spray mount, or other adhesive, slowly apply the paper and card leaves to the wall. Top Tip: To ensure that you are placing the leaf exactly how you’d like it to be, use some low tack masking tape to pin it up before you make the commitment of sticking. 9. 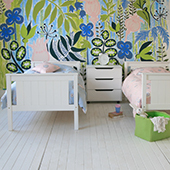 Once you’ve layered up all of the desired foliage, your mural will be complete! 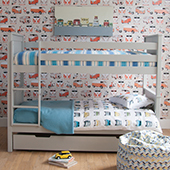 We’d love to see your photos, so if you’ve created a fun mural for your child’s room, send us a snap!